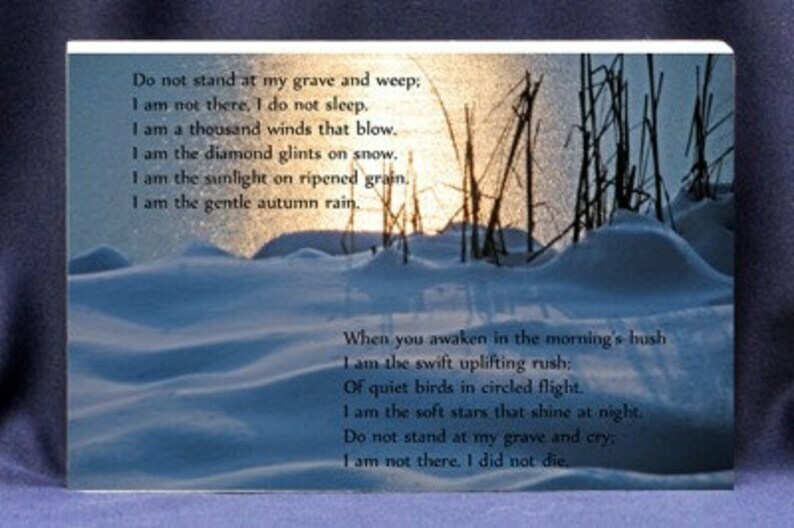 "Do Not Stand at My Grave" Poem on a Serene Winter Photo Scene. Customizable Memorial Gift Plaque. Beautiful memorial gift. Do not stand at my grave and weep,I am not there; I do not sleep.I am a thousand winds that blow,I am the diamond glints on snow,I am the sun on ripened grain,I am the gentle autumn rain. Designed by Vicki D. and sold by Absolute Inspirations gift store. Professionally mounted to a 3/4 inch premium pressure-sensitive light weight mounting substrate. We have partnered with the best professional photo lab in the area to bring our customers quality gifts at affordable prices, that will last for years! Available in 5 x 7 and 8 x 10. These gift plaques can stand alone or be hung for a unique standout look. The side of the mounting board is offered in either black or white. Regarding our turn around time: All customized gift orders will be received and processed Monday – Thursday. All orders received from Friday – Sunday will be received and processed on Monday. These are designed for you and it usually takes 2 - 3 business days to completely create a gift and ship it out on your behalf. We will invoice you for the additional cost of shipping if you order more than one plaque. OPTION: TO PERSONALIZE PLEASE PROVIDE US WITH THE NAME OF THE PERSON WHO HAS PASSED, THEIR DATE OF BIRTH AND THE DATE OF THEIR PASSING. Please use the custom request button to send us the sympathy gift information as well as a good contact number should we have any questions. If you prefer we can add a hand written note to accompany your heartfelt sympathies. If you have any questions please call us at 302 892 2572 to discuss or start a conversation with us on Etsy. THANK YOU FOR VISITING AND WE LOOK FORWARD TO CREATING YOUR SPECIAL GIFT! Gift Plaque For Mom Poem & Bouquet of Flowers In One! love it! this was a poem that my late Father had marked in a book he had. stands nicely by itself and i have it where i can see it every day. came fast and well packaged. Very fast shipping and it is exactly like in the picture. Very nice. We accept all forms of payment displayed on our pages. Pay Pal is included. All sales are final once your order has been placed. As stated if we have any concerns about customization our design team will contact you before completing your order. Our goal is for you to love your gift! All of our gifts are personally inspected and packed carefully before they are sent out. However, if you receive something that is damaged please call us at 302 892 2572 within 14 days of receipt of the item in question and we will work with you directly to rectify the situation. Once payment is received we will begin to work on your special gift and all sales are final. We explain our shipping times within each of our listings but for the most part all orders ship within 3 days from when the order is received. Our design team wants to ensure you are happy with your purchase and we will contact you if we have any concerns about the design before we create and ship your gift to you. In order to keep the process timely, we ask that you PLEASE INCLUDE a good contact phone number just in case we need to reach you. We do send out tracking information for all orders received so that our customers can track their package if they desire. We ship USPS priority mail and beginning January 2016 we will be offering USPS priority mail international shipping on select items. All shipping rates will be calculated for you at the time you place your order.